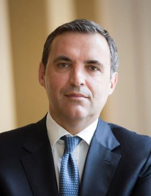 Konstantinos Vassiliou is heading Group Corporate and Investment Banking (GCIB) and is an Executive Member of the Board of Directors of Eurobank. He is responsible for the Corporate Banking Units, as well as for the specialized units of Shipping, Structured Finance, Global Transaction Banking, Eurobank Equities, Investment Banking & Principal Capital Strategies and Loan Syndications & Debt Capital Markets on a group basis. Mr. Vassiliou is also member of the Board of Directors of Eurobank Factors, Eurobank Equities and Athens Exchange Group. Before joining Eurobank in late 2005, Mr. Vassiliou was Country Manager for Greece, Cyprus and the Balkans region at Bank of Tokyo-Mitsubishi, based in London. Having more than 20 years of experience in Corporate & Investment Banking, he has been actively involved in most major M&A transactions and Debt Financings completed in Greece and Southeastern Europe and has led some of the largest and most visible Debt Restructurings in Greece. Mr. Vassiliou received an MBA from the Boston University Graduate School of Management in 1998 and a B.S. in Business Administration from the Economic University of Athens in 1994.